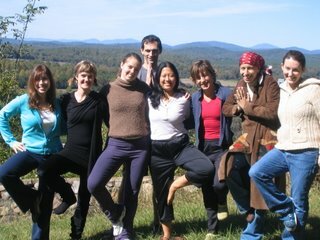 fresh back from a fabulous fall foliage retreat weekend with an amazing group of yogis. although i lead the retreat and am "on" the whole time, i always return refreshed after spending time outside, doing some yoga and meditation, sipping more tea than my body is used to, and sleeping to the sounds of nature. some take-aways that the group came up with were: carve out more unstructured play time, organize chaos, make a quilt and sit still, take baby steps and celebrate them/breathe when life is difficult, doing things without judgment and living with questions, focus on self-care, laugh and smile more/not take life so seriously/release control. i share these with you as a gentle reminder of our ongoing need to slow down, laugh a bit more, and celebrate play! p.s. podcast coming tomorrow. i hope you had a delightful weekend and got to enjoy some of the fabulous fall foliage and weather. Oh, it looks so great! It's still stinky hot down here in FL. I need a retreat big time and I am seriously thinking of joining you next year, Kimberly. Beautiful poem. Very accurate too, bumping into answers after we’ve let go of the obsession with haunting questions.